To get the best out of your exercise program and training it is vital that you learn how to read and understand some exercise terminology. Reps, Sets, Tempos , Intensity and Rest Periods are referred to as exercise variables. Your program will include all these exercise variables, so making sure you understand the terminology can be the difference of making your program effective rather than ineffective. This is simply the number of repetitions or repeats of a movements you are required to perform. For example, for a static lunge, lowing towards the floor and then returning to the start position would be one complete repetition or rep. So in simple terms a rep means a repeat of that particular movement. When reading your exercise program you will notice a number within the reps column , this will indicate the guided amount of reps required. This might also show two numbers, for example 12-20. This would require you to perform your exercise within a rep range of 12-20 repetitions. So your choice of weight selection should reflect your rep range as you would need to keep within the range when performing your exercise. The weight should be light enough so you can perform at least 12 reps and heavy enough to keep you under 20 reps. So when your strength improves this will show within your reps and you will automatically know when you need to increase the resistance for that particular exercise. This is the amount of times you repeat the number of repetitions. A set range may be given in which you begin with the least amount of sets and only add an additional set when you no longer suffer from muscle soreness from that exercise. 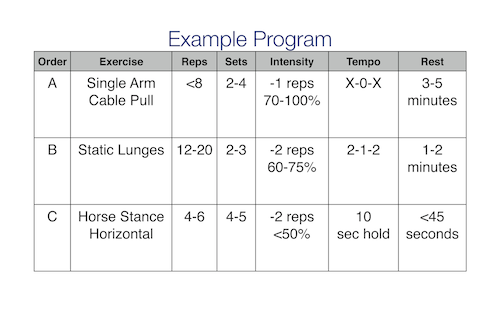 In the example below, the static lunge should be performed with 12-20 repetitions (each side) starting with two sets and then progressing up to three when appropriate. If you any reason you are tired during your workout and feel weaker than usual you should always reduce sets and not reps or intensities. This would insure you maintain your level of fitness and not over train. This is the speed of the repetition/movement. For example, the static lunge is performed with a 2-1-2 tempo. This translates as taking two seconds to lower to the bottom of the lunge, holding for one second and then taking a further two seconds to return to the starting position of the lunge. Power exercise should be performed in less than one second and are indicated by "X-0-X" in the tempo column. The word intensity is very often misunderstood when used in the health and fitness industry . Comments such as "high intensity aerobic classes" and "high intensity cardio workouts" are misrepresentation of the term intensity. These should actually be referred as "high density workouts" as they are high volume of reputations but low intensity resistance. This is usually shown as a percentage and relates to a measurement of your applied strength relative to your current level of maximum strength. For example, 60-75% would be a level of intensity to work at. So this would mean you would be required to work at 60-75% if your maximum strength. Generally we should stop exercising one or two repetitions before failure. So sometimes intensity is simply shown as “-1 reps” or “-2reps”. This would mean selecting a weight or intensity that keeps you within the rep range while maintaining the correct tempos and stopping before you reach failure, 1 to 2 reps before. If the exercise is aided with equipment or is body weight depended this will appear in the intensity column. Is the rest time taken between sets, supersets or circuits. Where both sides of the body are exercised consecutively, the wording “alternate” is found in the rest column. In the example below, the static lunge exercise should be performed with no rest when switching sides.